The Falls of Glomach may not quite be the highest in Scotland but it would be hard to argue that they are not the most spectacular. A precipitous ravine drops from the tranquil Gleann Gaorsaic, suddenly plunging the water of the Allt a’ Ghlomaich around 100m down, crashing off rock buttresses to the pool far below. 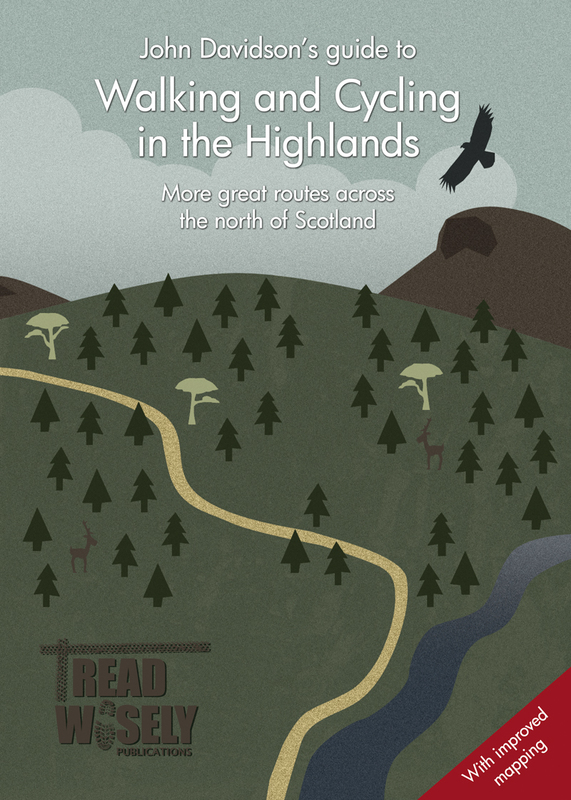 A National Trust for Scotland sign as you approach the top of the waterfall warns: “Danger. Please take great care.” It is worth heeding as the grassy ground is wet and slippery, while the little path that clambers down to a viewpoint is severely exposed and a slip could prove disastrous. Peter on the precipitous path to the viewpoint beside the falls. I certainly felt conscious of the situation as Peter and I made our way gingerly down to get a better view, making sure every footstep was well placed and reliable. I lay down on the ground to take photographs, holding the camera over the edge in an attempt to show the full height of the falls in a single shot; something I quickly learned was not possible due to the vastness of the scene. There is a path that leads to the falls from the outdoor centre at Morvich via the Bealach na Sroine but our route would first take us over a Munro I wanted to climb. 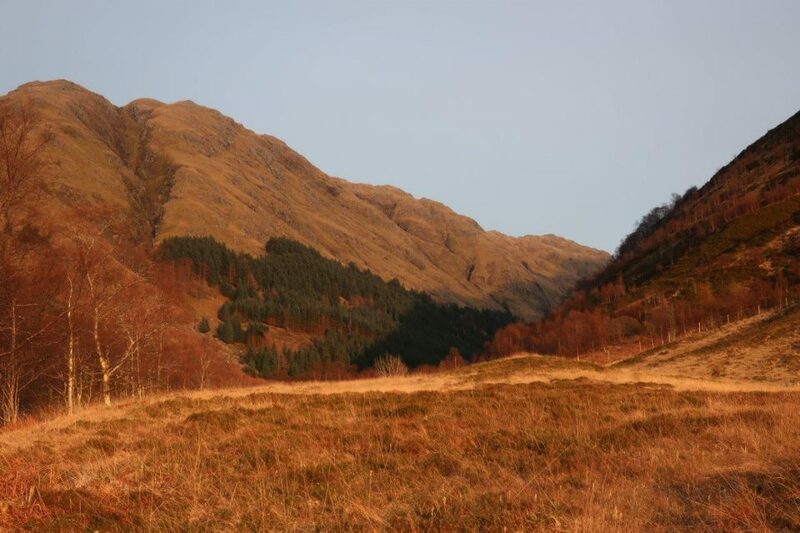 A’ Ghlas-bheinn lies in a lonely position north of the main Kintail peaks, though in the summer it is often climbed in unison with its nearest neighbour, Beinn Fhada. We didn’t have quite that much time given the shorter daylight hours but the route was more like a summer hike given that all but tiny patches of snow had disappeared from the hills. Overlooking Loch a’ Bhealaich to the distant Glen Affric summits, including the prominent Sgurr nan Ceathreamhnan. There were already a handful of cars parked opposite the outdoor centre as we arrived, and we soon caught up with a couple intent on climbing the rocky Graham of Carnan Cruithneachd, west of the falls. We’d crossed the bridge over the River Croe, passing the houses then turning right into a field signed for the falls. Having made our way past the young bullocks and out of the gate, the path then took us through nice birch woods on the lower slopes of Beinn Bhuidhe as it swung round into Gleann Choinneachain. Our fellow walkers forked left to follow a marker post with “FALLS” written down the length of it which led down to a footbridge, while we continued ahead, admiring views to the western slopes of A’ Ghlas-bheinn – a possible descent route for another day. As we got into the glen proper the excellent path continued above the Allt Choinneachain and opposite Dorusduain Wood, the feeling of wildness growing the higher we climbed. The wind was also picking up as we searched for a sheltered spot to take a breather. 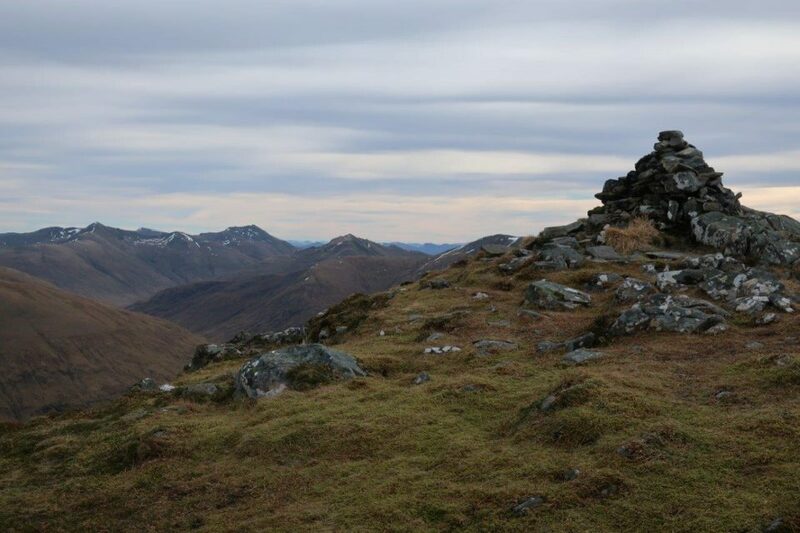 The summit of A’ Ghlas-bheinn with the Glen Affric Munros to the left in the middle distance. We found the perfect place where the stalkers’ path contours round to cross the Allt a’ Choire Chaoil where it meets the Allt Coire an Sgairne. After a short break we continued upwards towards the narrowing defile of the Bealach na Sgairne, ignoring a path which heads off right to the summit plateau of Beinn Fhada. At the bealach, the westernmost Affric tops come into view, just a tantalising glimpse of some of the spectacular vistas on this walk. At the large cairn, a path clearly heads up to the left and winds its way around a few crags, with one or two gentle hints of exposure as it gains the mountain’s south ridge. 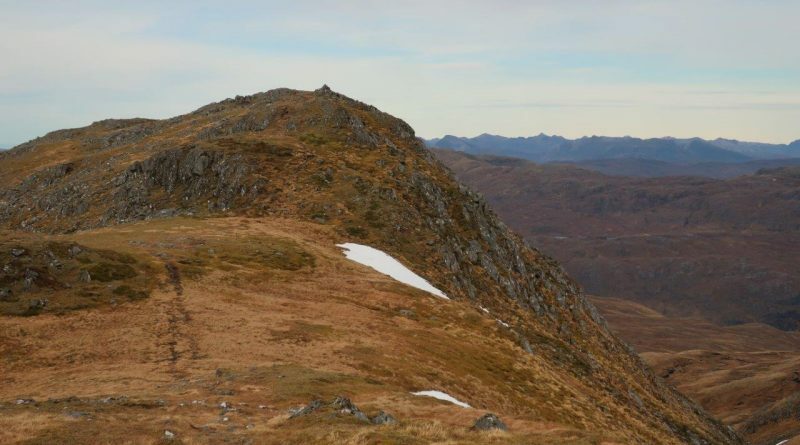 The terrain is lumpy and complex but without snow cover there is a reasonably clear path to follow as far as the summit, passing Loch a Chleirich on the way. The views all around are continuous, with the Cuillin clear of cloud visible to the west, while vast swathes of ridges and glens to the north and east remind you just how wild parts of the country remain, despite the hand of man. Our descent to the north to reach the falls felt fairly wild in itself, as the well-used out-and-back summit path ended at the cairn and we were left to navigate our way through complex pathless ground over Creag na Saobhie and Meall Dubh to reach the path over the Bealach na Sroine. 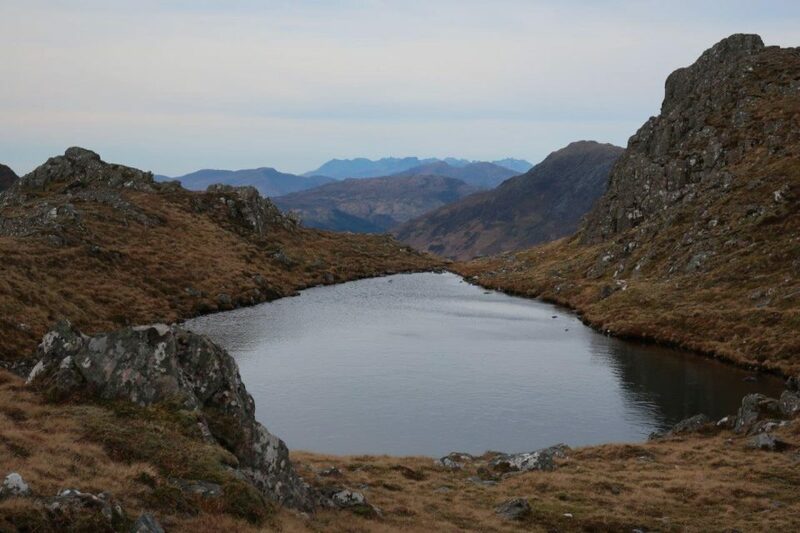 The lochan on the A’ Ghlas-bheinn ridge, looking towards the Cuillin ridge on Skye. 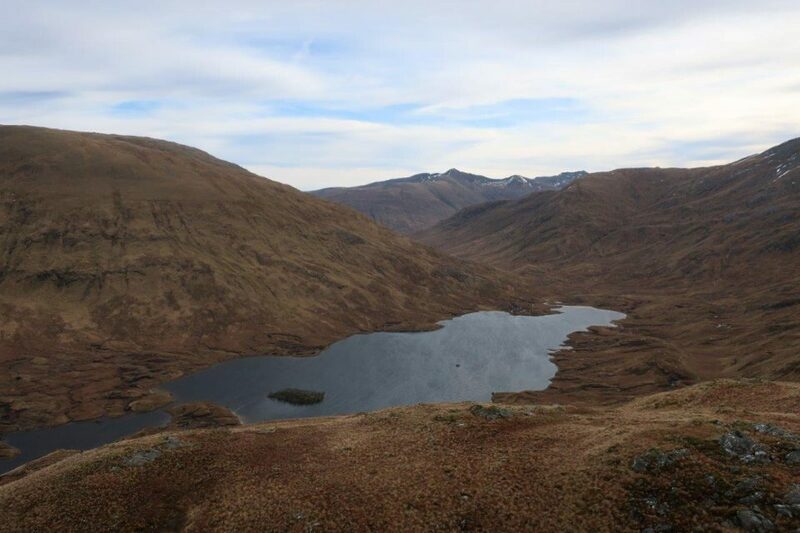 With good visibility we were able to plot a course past a series of lochans between the two, following a ridge off Meall Dubh to the right to avoid steep cliffs to the north-west. However, it was a bit of a relief to hit another good stalkers’ path after the rough ground we had descended over the last couple of kilometres. We rewarded ourselves with another refreshment break before heading right to the falls, soon following the path down a raised rib to reach a boggy area above the ravine, where we met a German couple who had followed the direct route from Morvich and were now on their way back. 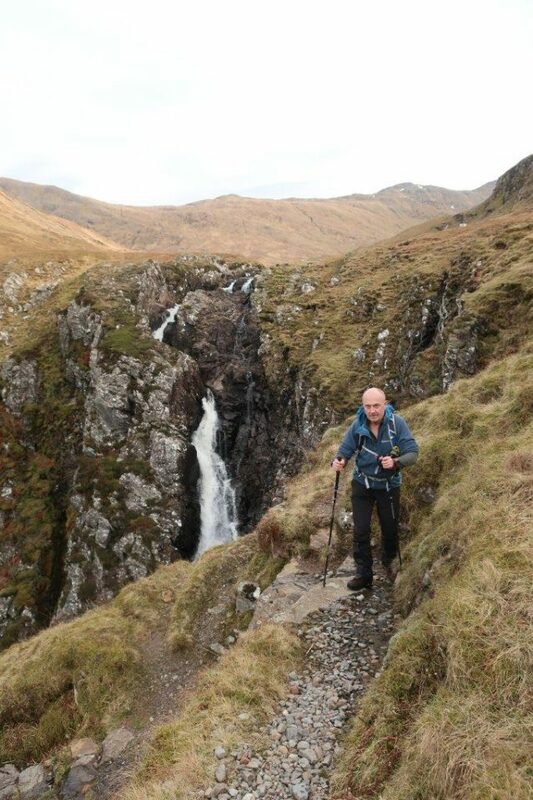 We explored the path for a little way to admire the falls but couldn’t see exactly where the route continues down into Glen Elchaig, as shown on the map – perhaps it is clearer in ascent than descent. Now we had to climb back out of the ravine and follow the path over the Bealach na Sroine and down into Dorusduain Wood. As it approaches the trees, the path drops steeply to cross a bridge then keeps east of the main burn until it crosses around 600m further on. Gleann Choinneachain in the evening sunlight. Keep left at a track junction then, after the hairpin bend, go through a gate to the right into a field to pass a ruined building. A little way past an impressive rope swing, go left to drop to a footbridge which crosses the Abhainn Chonaig and rejoins our outward route at the “FALLS” marker post. Terrain Stalkers’ paths, pathless complex terrain north of summit; dangerous exposure on path to falls. Navigation skills required at all times and winter skills required if snow covered.